It is no secret I love old vinyl records. I grew up with them. I still have hundreds of Lps and 45 rpm records which I pull out from time to time to play on rapidly aging record players. I used to fear that there would be a time when once my old record players give out the records would be just relics of a time gone by. I don’t worry about that too much anymore as vinyl has been making a modest yet steady comeback in recent years. One of the companies that gives me great hope that records and record players will be around for a few more years to come is Crosley. Crosley, whose tagline is “Yesterday, Today & Tomorrow” makes a great collection of record players, mostly with a blend of retro looks and modern technology. I have a Crosley record player that has a built-in radio and CD player, which is really cool. But I absolutely love the Crosley Spinnerette, the perfect blend of old and new. The Crosley Spinnerette has sweet retro looks and can play your records, but it also has a USB connection to allow you to hook it up to your computer and the world. Kudos to Crosley and everyone else out there that realizes that honoring our past is the best way to ensure a great future. 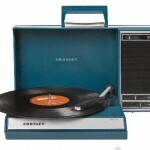 See the Crosley Spinnerette here. See all the great products of Crosley here.